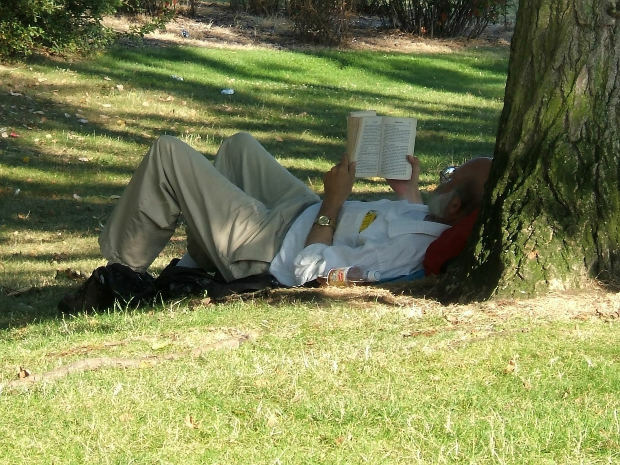 Whiling away a sunny afternoon with a good book...is there any better way to spend your time? Image courtesy of dhannte on Morguefile. In a recent conversation with another blogger, we discussed book signings. I confessed that I’d never been to one. So when I saw that one of my favorite modern authors, David Baldacci, was scheduled to appear at a bookstore within reasonable driving distance, I decided to go. He was promoting his new bestseller, The Innocent. As I drove to the book signing, I wondered: What happens at this event? Where was it being held inside the bookstore? What are fans expected to do? And am I crazy for driving through rush-hour traffic? When I got to the bookstore , I discovered that the event was upstairs, next to the cookbooks, sci-fi novels and teen thrillers. There was a signing table, a hand mike, a loudspeaker and podium at the front, and rows of chairs already occupied by other fans. Most of the audience looked to be between 30 and 70, with a few exceptions. Since no chairs were available, I resorted to sitting on the floor at the front. Nice to have an unobstructed view, but I was next to the loudspeaker. Ouch. 1) “Wish You Well” is being made into a movie. Filming starts later this year. 2) The Camel Club (my favorite group of characters that he’s created) is coming back in a novel. 3) He is working on some TV adaptations with Shane Brennan from NCIS. 4) The Innocent is #1 on the Publishers’ Weekly bestseller list. Nora Roberts and John Grisham are #2 and #3. The hand mike occasionally went on strike during the Q&A period, which made for some witty banter between David and the audience. Then people started lining up for the book signings and photos with the author. They were divided into three groups and almost everyone had a wristband to identify which group they were in. The bookstore’s staff kept everybody moving smoothly and the place emptied out fairly quickly. One person claimed the banner hanging behind the signing table. She asked David to autograph it, so he wrote: “To Elizabeth, rock on! Your bud, David Baldacci”. Overall, it was a fun experience and worth the traffic battle. I got to compliment him in person on his novels, which is a rare experience for me. I also liked getting the news tidbits and yes, people, I got an autograph.